Fall Farmshare to start week of September 10th! The Fall Farmshare is coming up quickly! We will start the first baskets the week of September 10th. Check out the Farmshare link above to see available pickup locations and times or to sign up online. Please email me with any questions (rattlesgarden@yahoo.com) Here's a sneak peak at what the first week's baskets will look like! Tonight's email will be short. I just want to remind all of you that we will skip baskets this week to give our field crops another week to grow and will resume baskets next week. This skipped week will not count as part of your 10 weeks of food, we will just add another week in July. For a quick update from the field, we've had a ton of plant growth in the last week. Warmer daytime and nighttime temps have helped the ground warm up considerably and in looking at the 10 day forecast, it won't be long before farmers switch to complaining about the heat rather than the cold! I told a few of you yesterday that I've started to see the squash plants blooming with baby squashes attached to the flowers. It is such a strange year for us...I never would have imagined y'all might get squash (a summer crop) before you got broccoli, cauliflower and green beans (spring crops), yet, it appears that might happen! Overall, everything in the field is looking really good and we are really close to winding up the bulk of our spring planting by the end of this week. Our farm excitement for the week included the delivery of a new tractor for the farm as well as one for Gus. 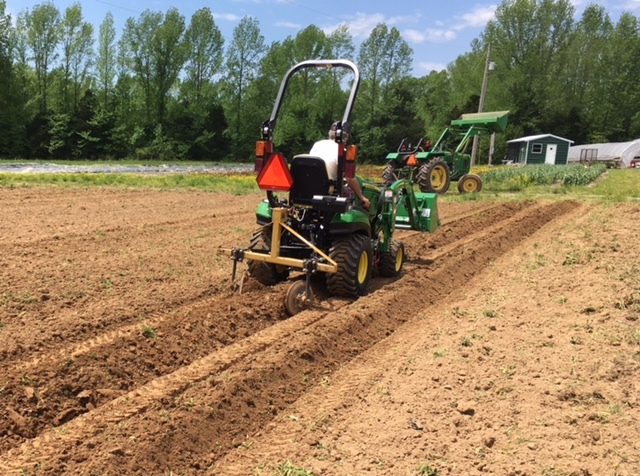 We added a small 25 hp tractor to our lineup to narrow the space between our beds in certain fields allowing us to get a third again more beds into a field. If you've ever heard me talk about the farm, I often tell people I've definitely learned farming the hard way, through trial and error. Nowhere has this been more apparent over the years than in purchasing the right equipment to get the job done on a farm our size. This tractor is one more piece I'm putting in place to help make this farm more sustainable on a slightly larger scale for my farmhand Mike and I to be able to do the bulk of the farm labor ourselves. Until next week, y'all....please don't hesitate to email or text me with any questions! See you soon! 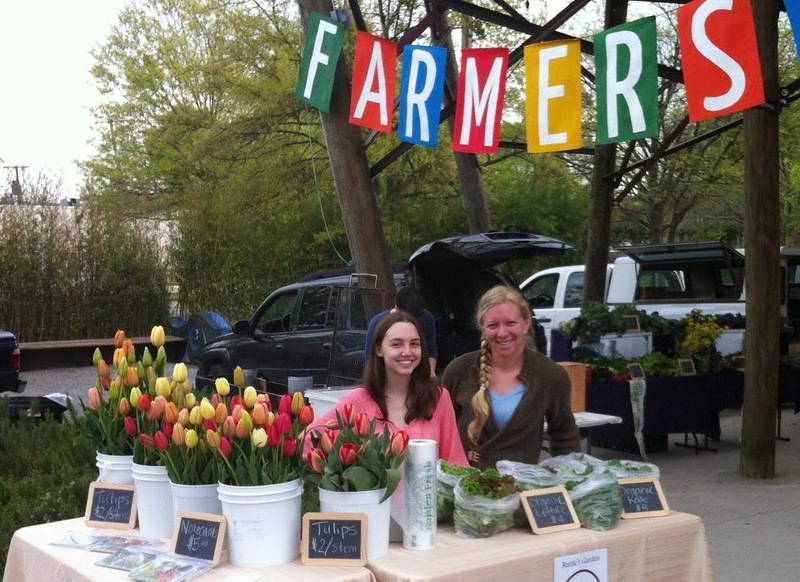 Farmshare members, we will begin this week! Your weekly newsletter just left my inbox. 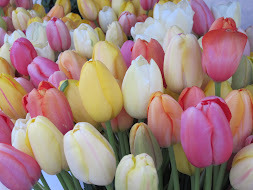 While I would love to post it here on the website, it does have information in it that is for your eyes only so if for any reason you did not receive this week's newsletter, drop me an email at rattlesgarden@yahoo.com and I will forward it to you. In the meantime, I'll share a few pictures of the beautiful dianthus I have in bloom right now. Enjoy! I'm taking a break this morning from pruning tomato plants to get this much needed newsletter out of my head and into your inbox. Y'all. This has been the craziest, most difficult spring I've run into over the last ten years we have been farming. Our farm is not alone in losing more crops than ever before due to extreme colds over the last two months. I heard more stories of lost crops yesterday at market than ever before. But farmers are nothing if not persistent. Just like us, most continue to replant and hope for the best. So far, I'm thankful that the only crops we lost to the cold were the first round of green, yellow and purple beans and sweet corn. Both of these were easily replanted and the investment lost was simply seed and my time sowing it, rather than weeks of care in the greenhouse like some other crops. Otherwise, our tunnel tomatoes pulled through with flying colors and the other cold tender crops stayed warm in the greenhouse. Now I'm faced with the ever difficult decision of when to start the Farmshare. We always shoot for starting the first week in May. This is easy in a warm spring where we have tunnel crops just finishing up and making it into the first baskets followed closely by the first field crops. This year though, has not been warm and the field crops are two to three weeks behind where they typically are. My initial thoughts were that we would push the start of the Farmshare back a week or two to give the field crops time to catch up. However, if I do that we run the risk of the late spring tunnel crops being done before the Farmshare starts. I have gone back and forth about this decision for the last few days and I think I've come up with a compromise that gives y'all the best of the food but I worry might make things confusing. I'm going to do my best to make it clear though. We are going to go ahead and start the Farmshare next week as planned, so Tuesday, May 1 will be the first LR pickup, Thursday, May 3rd the first farm pickup and Saturday, May 5th will be the first Hillcrest pickup. I want to do this so y'all catch the swiss chard, kale and carrots coming out of the tunnels as well as lettuce mix, microgreens and green garlic. The first basket will be heavy on both salad and cooking greens. And while I hope to have salad greens available to y'all most of the summer, the quantity will definitely lessen as the heat comes on and we'll lose the cooking greens as soon as it gets hot. Now, here is where the potentially confusing part comes in. It is possible that, for the first time ever, we may skip a week of baskets the following week in May while we wait on field crops to get ready. I could be wrong about this, we'll see what the weather brings over the next two weeks, but it won't surprise me if we need to do this. I will do my absolute best to communicate this clearly to y'all everywhere I possibly can, by newsletter, on the website, on FB. If you ever question whether you have a pickup, you simply need to drop me a text at 501-941-0331. 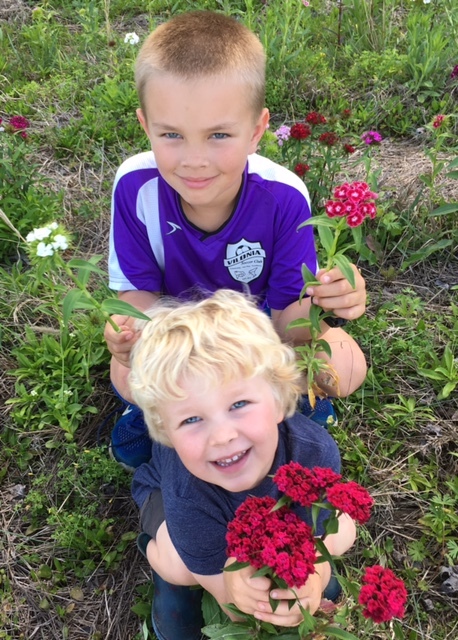 For those of you getting this newsletter, that are not signed up yet, it will be the last newsletter that you get until I open fall registration in August. If you are still interested in joining this year, we do still have a few spots open at every pickup location but we are sold out of Eggshares for the season. As for crop progress, as usual, the sugar snap peas LOVE cool, rainy springs. They are looking fantastic and we have about 400 feet more of them than ever before. My boys are checking on them every day...waiting. 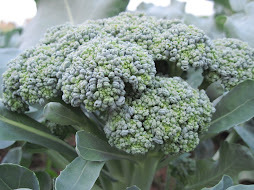 Broccoli, cabbage, cauliflower, collards and swiss chard are looking beautiful in the field and will be some of the first veg you get in mid-May. 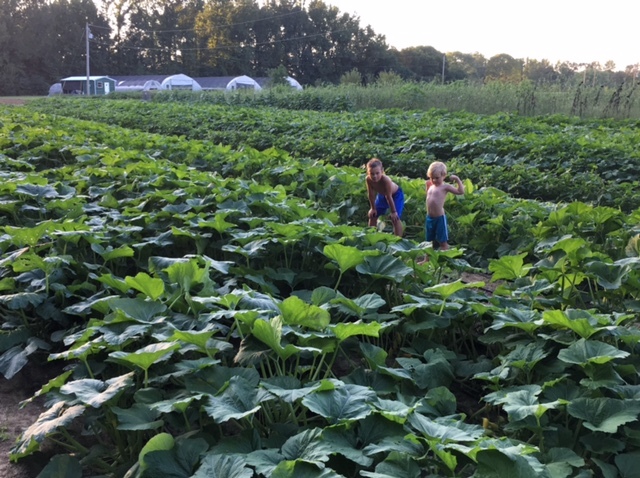 The zephyr squash, zucchini, butternut and spaghetti squash all went into the field last week and look pretty great so far. 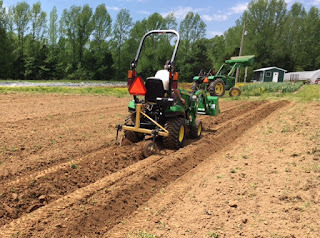 The cherry tomatoes will start going in the ground this week as well as our field tomatoes and basil. Mike, my farmhand, the boys and I are hanging on until reinforcements get to the farm next week in the form of a young couple experienced in farm work, moving to Vilonia from Washington state as well as a couple of former interns that will be working on the farm for the summer starting in mid-May. 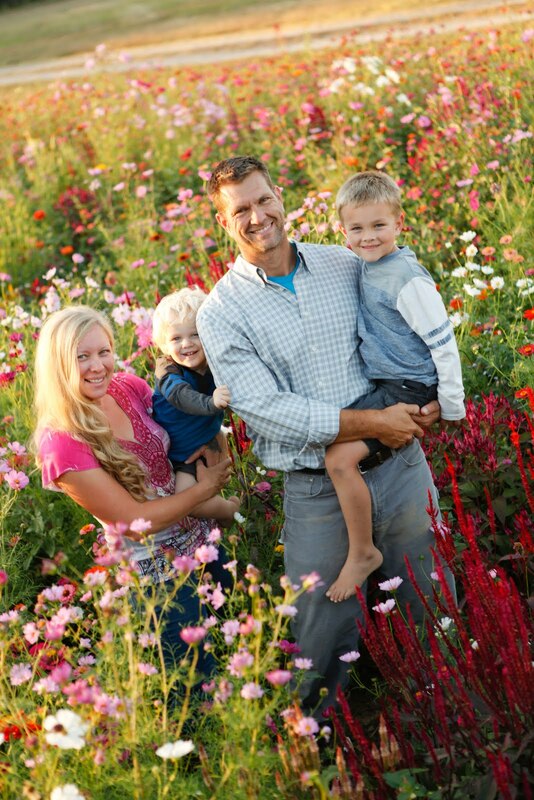 If I'm looking for a bright side to a tough spring it's that had all of the spring crops done what they were supposed to, Mike and I would be drowning in work rather than just barely staying afloat until our help shows up. Speaking of work, I need to get back to it. Please, don't hesitate to holler at me if you have any questions. Or if you need to use your skip week....did I mention skip weeks? For those of you that are new to the Farmshare, you get one skip week each season. As long as you let me know in advance that you will be skipping your basket for a given week, we will tack that basket on to the end of the season so you still get 10 baskets. You can let me know the week before, or by 6 am the morning before, or right now. Have a great week, y'all! I'll be in touch next Sunday for last minute details regarding next week's baskets. Thanks! 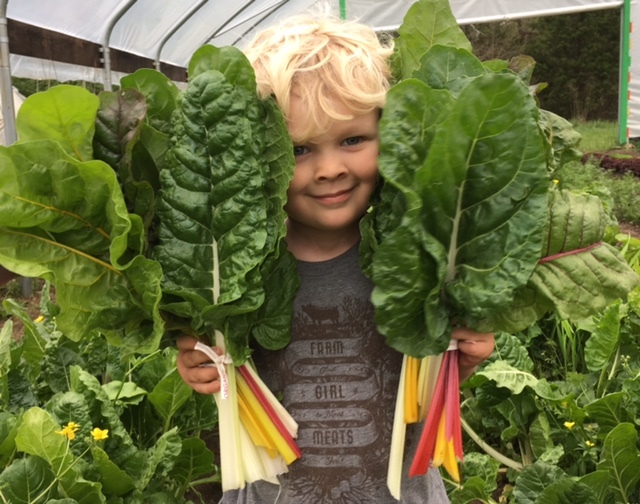 Gus showing off swiss chard bundles for market. Squash beds tucked under blankets during the most recent cold night. 1000 cherry tomato seedlings ready to go in the field this week. Spring mix ready to harvest. As I sit here updating the Farmshare information and wading through seed catalogs this picture of Gus planting seeds back in September keeps floating across my computer as if my computer knows I'm thinking warm thoughts on this cold day! I like this part of the process every year. Looking through colorful seed catalogs, going just a little stir-crazy inside and excited to start working in the greenhouse over the next few weeks. I have finally update the Farmshare information after repeated inquiries over the last few days. I hope you take the time to check it out by clicking on the Farmshare tab at the top of the page and consider joining us for the season. Happy New Year!